There is nothing like a batch of chewy oatmeal chip cookies, fresh from the oven. I know most folks go wild for the chocolate-dotted variety, but as I may have mentioned before, for me, it’s all about the peanut butter chips. That’s why I was so excited to find a bag of tasty, trans fat-free peanut butter morsels at Trader Joe’s last month. 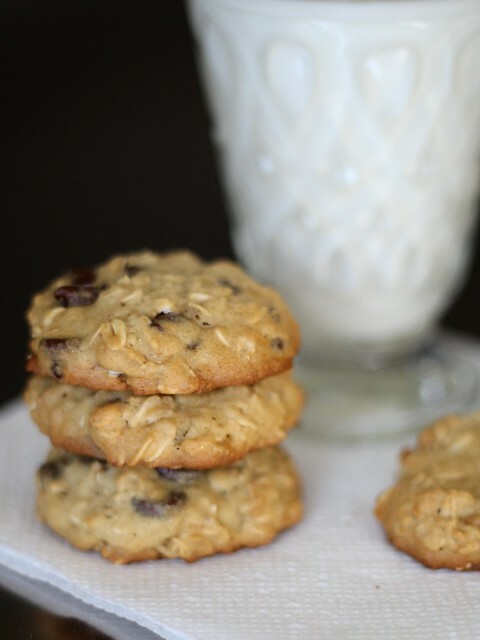 Go ahead and make this oatmeal cookie recipe your own. Like raisins? Add them. Prefer yours unadulterated by pockets of molten chocolate? They work just as well plain. We’ve barely scratched the surface of possibilities! These cookies are made without xanthan gum, it’s not a typo! Preheat oven to 350°F. Line several rimmed baking sheets with silicone baking mats or parchment paper; set aside. Whisk together oats through kosher salt in a small bowl. Combine wet ingredients (softened butter though vanilla extract) in the bowl of a stand mixer fitted with the paddle attachment¹. Mix on medium speed until well-combined and lightened — about 2 minutes. Scrape down bowl, add dry ingredients and stir on low until mixed evenly. Stir in chips or raisins, if using. Proceed to baking or transfer the dough to a smaller bowl, cover it tightly with plastic wrap and refrigerate for up to five days (follow the same instructions below when ready to bake, no need to bring batter to room temp, though they may need an extra minute or two in the oven). Onto prepared baking sheets, scoop 1-1/2 tablespoons of dough leaving about 2 inches of space between each. Gently press down cookies until they’re about 1/2″ thick — if you’re pressing room-temp dough, you may need to lightly moisten your fingers with water to prevent it from sticking, it’s not necessary when pressing refrigerated dough as it’s no longer very sticky. Bake cookies for about 9 – 10 minutes or until the bottoms are nicely browned. Allow to cool on baking sheet for about 2 minutes before transferring to a cooling rack. Once completely cool, store tightly wrapped at room temperature — they’re best eaten within a few days. ¹ Dough can also be made by using a hand mixer or 100% manually with a wooden spoon.